Hiring a bookkeeper can be tough because it is assessing the credentials of the job seeker in a glance. The field is quite a niche and requires special expertise to get through the requirements in any business. It is hence advisable to refer to the following 10 key points that need to be considered before hiring a bookkeeper for business. According to the stipulations under The Tax Agent Services Act 2009 (TASA2009), anyone providing bookkeeping services needs to be a registered BAS agent. Before hiring a bookkeeper, ask if they have their BAS registration or at least be qualified enough with a Certificate IV in Financial Services. It is preferable to hire a professional who is associated with bookkeeping associations in the country including The Institute of Certified Bookkeepers (ICB). References may not be always reliable, but worth the effort in verifying one’s work along with a portfolio. Past projects can give insight about the ability of the bookkeeper. Also, online profiles and websites can even offer independent reviews of the services provided by the bookkeeper. A common complaint has been the delivery times of many bookkeepers who are quite slow to respond to emails and usually fail to deliver on schedule. Relay your expectations about the expected response times so that the intended delivery is on time. It is evident that every bookkeeper needs to be well versed with computers as everything has become automated. One should know the basics of bookkeeping tools and software including Word, Excel, e-mails and the web. If the bookkeeper is unfamiliar with your industry, there is a definite learning curve involved. One should ask about other clients in your industry and even ask about problems affecting bookkeeping related to your industry and the process of resolving them. One should know about the charges of bookkeeping beforehand, whether the pricing will be for a fixed monthly fee or on an hourly basis. Nowadays some bookkeepers charge a fixed rate. Make sure what is included in the fixed rate and what is not. You want your bookkeeper to manage accounts accurately and on-time. You need to get to the end of the financial year without any problems. One should assess whether the bookkeeper is an expert by the fact that they can review their own mistakes or a good bookkeeper who can only process transactions accurately. Ask about their methods or even ask their references about their expertise. After processing day-to-day transactions, one needs to finalize on a medium of communication to know about the bookkeeping process and deliverables. 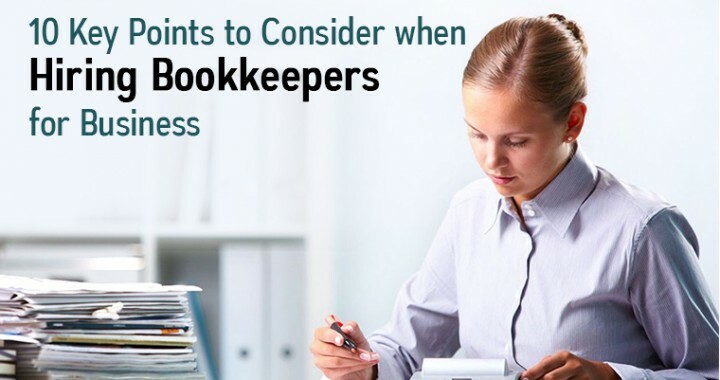 By communicating regularly, one can keep the bookkeeper abreast of expectations and even convey requirements effectively. Check their communication and if it is clear and concise, making absolute sense about the proceedings or not. Check the best medium of communication – phone, Skype or email and finalize the medium suiting both. Share financial information with bookkeepers based on how much you trust them with information privacy. Ask about internal controls and duty segregation so that there is no leak and impact on privacy. Get your bookkeeper to report on a periodic basis – daily, weekly and monthly depending on your requirements. The reports need to be prompt and transparent enough to manage your business dealings efficiently. The afore-mentioned 10 key points are crucial in hiring a bookkeeper for your business. Adhere to them, and you will be able to land an efficient and experienced bookkeeper for your needs. Posted in Uncategorized and tagged bookkeeping, business, expert, hiring, service, tips.